What Next? 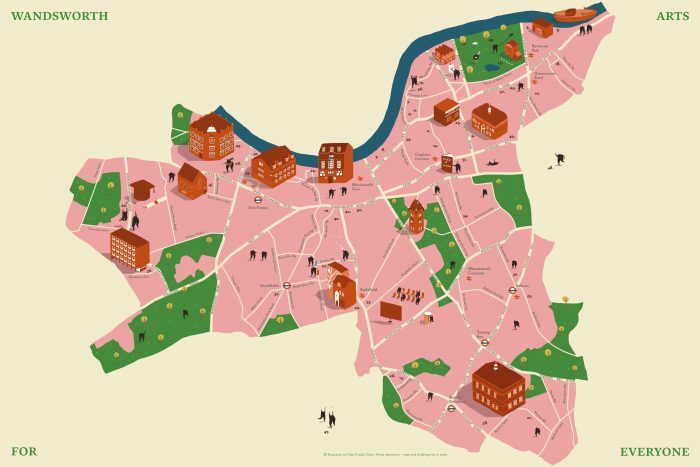 Wandsworth work to promote the arts across different sectors in the borough, including the local authority, health and housing services and major developments. They have been active in seeking to influence cultural strategy and the use of the public realm on these sites for arts and culture events. There’s something for everyone, for every age…from world class venues to hidden local gems, almost every day of the week all year round, right on your doorstep. What Next? 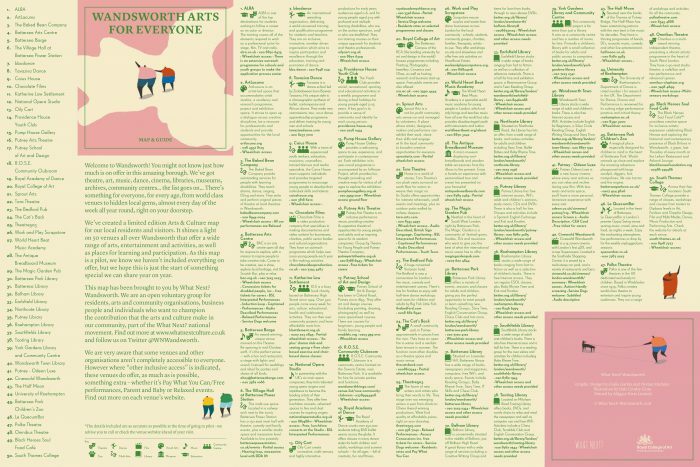 Wandsworth worked with partners, organisations, artists and practioners to create a limited edition Arts & Culture map for local residents and visitors. It shines a light on 50 venues all over Wandsworth that offer a wide range of arts, entertainment and activities, as well as learning and participation. As this map is a pilot, it doesn’t include everything on offer, but is just the start of something special to give a taste of what is available. This map has been brought to you by What Next? Wandsworth. The group is an open voluntary group for residents, arts and community organisations, business people and individuals who want to champion the contribution that the arts and culture make in Wandsworth’s communities, part of the What Next? national movement. Find out more at www.whatnextculture.co.uk and follow us on twitter @WNWandsworth. We are very aware that some venues and other organisations aren’t completely accessible to everyone. However where ‘other inclusive access’ is indicated, these venues do offer, as much as is possible, something extra – whether it’s Pay What You Can/Free performances, Parent and Baby or Relaxed events. Find out more on each venue’s website.